RECLAIM is a charitable organisation for youth leadership and social change, with a focus on supporting working class young people. It describes itself as existing “to create a society in which being from a working class background no longer presents barriers to achievement, success, or influence”. Louise, our Director, was delighted to become involved in one of the charity’s programmes recently. The LEAD programme involves 30 Year 8 girls from four secondary schools in Rochdale: LEAD stands for Leadership, Enterprise, Activism and community Development. The programme links in with the national curriculum at Key Stage 2 (emotional intelligence and critical thinking) and Key Stage 3 (citizenship, leadership and personal development). On Monday 11 and Tuesday 12 December the charity welcomed the students, who are aged 12 and 13, to Newgate in the centre of Rochdale to focus on developing their entrepreneurial and leadership skills. 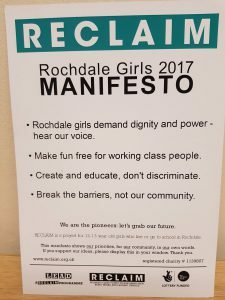 The students were tasked with developing an idea that would, as their manifesto (shown here on the left) states, “make fun free for working class people”. At stake was an investment of £1000 to start up the winning project. Divided into 5 groups of varying sizes, on day 1 the students set about developing their ideas with the help of a number of female Rochdale entrepreneurs and business figures. On day 2, Tuesday 12 December, Louise was delighted to be invited to sit on a “Dragons’ Den”-type panel in front of which the students had to present their ideas, effectively pitching to win financial support. All of the groups shared a determination to give their peers opportunities to be the best that they can be by providing facilities in which they would feel confident to express themselves. This would be achieved through a variety of activities ranging from board games and table tennis through to cooking and self-defence. Choosing a winner was very tough for Louise and her fellow “dragons”! LKT is looking forward to continuing its involvement with RECLAIM and the LEAD programme – watch this space for future updates. For more information about the charity and its work, visit the RECLAIM website at https://www.reclaim.org.uk/ or follow on Twitter: @RECLAIMproject.